The Xiaomi Pocophone F1 runs on the Qualcomm Snapdragon 845 mobile platform, meaning you get Snapdragon’s powerful AI engine on the latest flagship 10nm class chip. Enjoy superior performance and lower power consumption. The system-level full screen gestures of the Xiaomi Pocophone F1 allow for a smoother experience on the 18.7:9 Full Screen Display. The Corning Gorilla Glass is highly resistant to wear and tear, so you can always use your phone without worry. The 12MP + 5MP AI dual camera features dual pixel autofocus and a 1.4um pixel sensor in the main lens, enhancing photo brightness and quality while drastically improving focus speed, especially while in motion or in low-light conditions. Powerful analytic capabilities couple with 2um large pixel (4-in-1 Super Pixel) technology to give you clearer, brighter selfies. AI Beautify 4.0 and precise bokeh effect makes each shot seem as if it is taken in front of a studio canvas. Poco’s AI camera can distinguish between 206 common scenes and automatically adjust exposure, saturation and other optimisations. Keep the core components of the Pocophone F1 nice and cool with the LiquidCool Technology designed exclusively for gaming phones. No matter how hard you’re gaming, the cooled processor has no problem keeping up stability and high frequency output. Say goodbye to slow response time and frozen screens, this phone stays faster than fast. 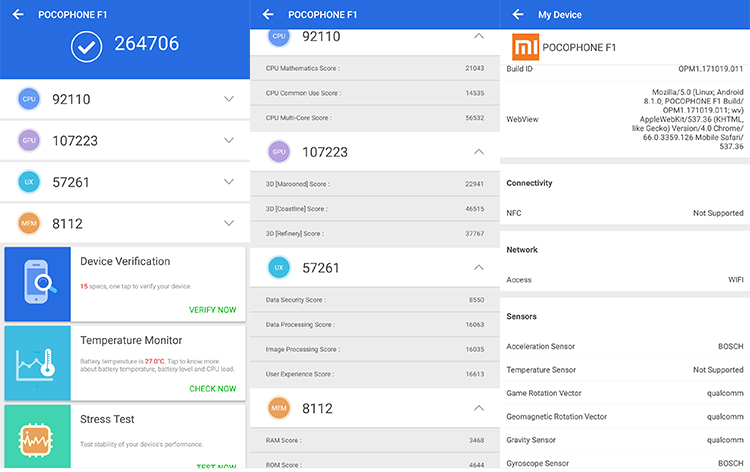 Xiaomi re-customised MIUI specifically for Pocophone to make it lighter, faster and smoother. Now equipped with a turbocharged engine, Pocophone F1 gives you increased swipe sensitivity and accelerated app start-ups. And you can forget all about scrambling to find an app. Equipped with an infrared light sensor and infrared camera, face unlocking is instant and consistently successful, even in darkness. In addition to the popular type-C charging port, the Pocophone F1 comes with a 3.5mm audio port that is rarely seen in modern flagship phones. Freely listen to music and gaming audio while charging. The 4000mAh high-capacity battery has the endurance to keep your phone going as you game and snap pictures without a second thought. It provides enough power for 30 hours of calling or 146 hours of audio playback on a single charge.